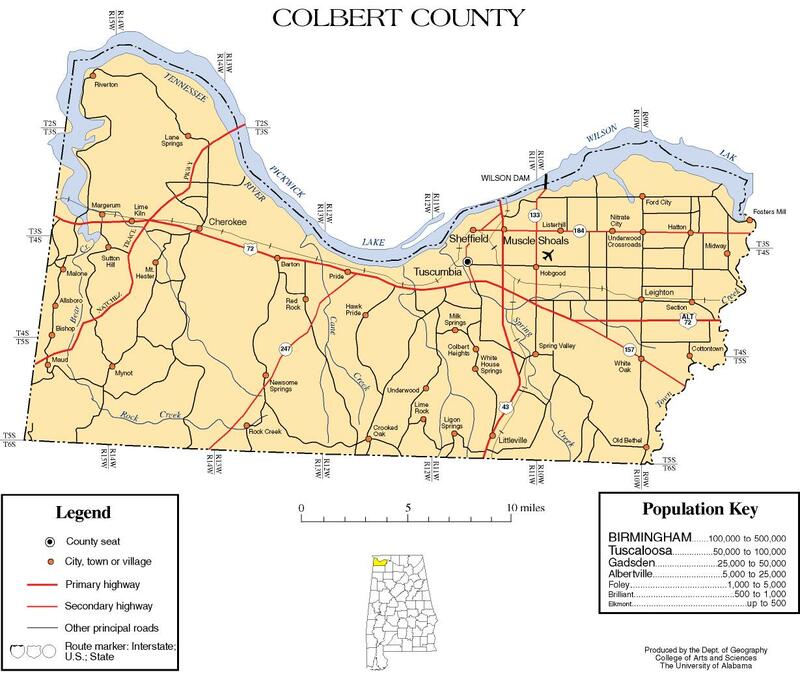 Colbert County was created by the Alabama legislature on 1867 Feb. 6, from part of Franklin County. It was abolished by the Constitutional Convention on 1867 Nov. 29, and re-established by the legislature on 1869 Dec. 9. It was named after George and Levi Colbert, noted Chickasaw chiefs, who resided in the county. Colbert County is located in the northwestern part of the state. It currently encompasses 589 square miles. It is bordered on the north by the Tennessee River and Lauderdale County, on the east by Lawrence County, on the south by Franklin County, and on the west by the State of Mississippi. An election in 1870 established the county seat at Tuscumbia. Other towns and communities include Cherokee, Sheffield, Leighton, and Muscle Shoals.